Dr. Eduardo Yassuda has extensive experience related to coastal and oceanographic engineering, modeling of hydrodynamics, water quality, and ecological processes in coastal and estuarine systems. He has been actively involved in the implementation and improvements of more than a dozen hydrodynamic and water quality models for locations worldwide. Over the past 25 years, Dr. Yassuda has helped connect engineering to ocean science—and fulfilled a childhood dream of becoming an oceanographer. During his doctoral work, he specialized in numerical modeling of hydrodynamics and water quality. 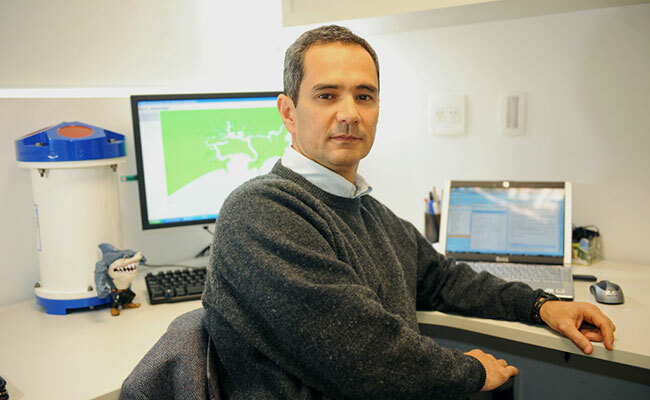 As director of Tetra Tech’s coastal and oceanographic services in Brazil, Dr. Yassuda leads a 40-member team that provides both predictive and hindcast modeling services for the oil and gas industry, ports and harbors, and coastal districts in Brazil and globally. They also have designed operational marine forecasting and warning systems. How do Tetra Tech’s modeling services help port authorities and oil and gas customers? Clients are usually looking for two different types of modeling, based on time scale. So if you had an accident—an oil spill or if someone is lost in the ocean—we try to reproduce the event to support the damage assessment, clean up and containment, or search and rescue efforts. The other possibility is looking forward—forecasting potential impacts of events, port facilities, or offshore operations. We simulate climatological conditions or extreme events. Our services are often used for environmental impact statements or contingency planning projects. More recently we have developed operational modeling tools, which involve forecasting meteorological and oceanographic conditions for a period of time—say the next five days—with a high degree of accuracy and high resolution in the area of interest. For instance if a port has a diving or dredging operation where the sea state is critical to the operations, we can help them forecast and better manage those operations, and be safer and more economical in how they deploy resources. For example, we helped a local port authority better monitor and contain the plume from a dredging project. By dredging when sea and meteorological conditions were favorable, they could prevent the expansion of the plume into sensitive areas. Do your modeling services help make response efforts more efficient? Yes, for example we have contracts here in Brazil with PETROBRAS and other energy companies that rely on us to have forecasts of currents and winds. If an accident occurs, they give us the description of the accident, where they were, the type of oil leaking. We give them forecasts within two hours, and with the information we provide, their response team can plan and respond better and more effectively. Since the Deepwater Horizon accident in the Gulf, it became clear that accidents will occur. It’s a matter of being prepared and being able to respond quickly. We also have assisted the Brazilian Navy and PETROBRAS in several search and rescue operations. Based on where they found debris, we were able to create simulations to help the authorities define the optimal search areas. How is Tetra Tech helping develop better traffic control for ports? There are several ports, mostly in Europe, using Vessel Traffic Marine Information Systems (VTMIS) – this is like air traffic control for ships. We are working with Brazil’s Navy to develop the guidelines for the ports in Brazil. We are also working with the Santos Port Authority, which is largest port in South America, because they want to implement this VTMIS system and will need operational modeling for the coastal zone to help guide and control the vessels approaching the harbors. It is even more complicated when harbors have to work with favorable tidal conditions to accommodate new, larger vessels. Do your models work in coastal environments? Until recently there were offshore models for the entire ocean and separate models for coastal areas. These only communicated based on imposing a set of boundary conditions, which prevented the coastal model from forecasting real situations. We developed global models that we can connect to specific local coastal models instead of imposing a boundary condition. Then we can forecast sea levels, currents, and flooding conditions using state of the art tools, which results in a more accurate prediction of the coastal conditions. How does your data collection technique improve your ability to deliver solutions to your clients? We started with data collection to respond to client expectations and requirements. Usually there has been a battle between data collection programs and modeling programs. The modelers will blame bad data, and the data people don’t design their collection programs with an aim to accommodate modeling import. With expertise in both areas, we can assist clients in developing monitoring programs that work for both purposes. And our services don’t stop with modeling. Tetra Tech aims to provide the client with a broad solution to their coastal and oceanographic problems. It involves data, modeling, analysis, and engineering.